A committee tasked with revamping a national workplace study released a 200-page report recently recommending major changes in workplace surveillance. The goal, according to the committee, is to reduce the health burden caused by injuries in the workplace. The report defines surveillance as ongoing collection and analysis of health data. The last, and only report, examining the U.S. workplace was released in 1987. That workplace surveillance report, “Counting Injuries and Illnesses in the Workplace: Proposals for a Better System,” by the National Research Council (NRC), offered important insight into the American workplace. With 156 million adults working in the U.S. and an annual cost of $250 billion in workplace injuries (as of 2007 figures), the federal agencies that sponsored the latest report (Bureau of Labor Statistics, National Institute for Occupational Safety and Health and Occupational Health and Safety Administration) recognized the need to better understand the relationship between work, workplace injuries and illnesses. The agencies created a committee to oversee how the new workplace surveillance system might work. They looked at the strengths and limitations of national and state approaches, as well as different methodologies and approaches to surveillance. With that, they developed a vision for a smarter, more effective surveillance system. Reflecting on changes since the 1987 NRC report, they identified critical gaps where data was lacking and evaluated new ways to collect, analyze, interpret and disseminate the data in a cost-effective manner. In addition, they examined the roles of current federal and state agencies as well as how other countries study workplaces. 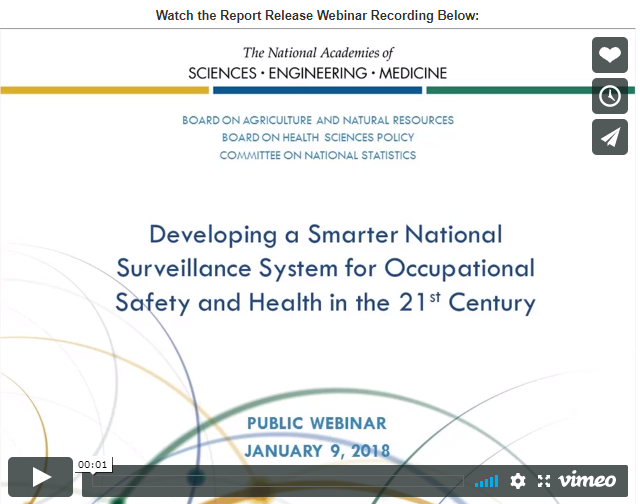 Last week, a webcast (above) based on the new report, A Smarter National Surveillance System for Occupational Safety and Health in the 21st Century Report, offered additional insight into the need to identify and update the nuances of today’s workplace. The committee’s vision on the future of workplace surveillance and data sharing, according to the webcast, is a collaboration among state and federal agencies and the health system. According to Margaret Seminario, director of Safety and Health at AFL-CIO, a lot has changed in the 30 years since the last report. The first is to prioritize and coordinate OSHA surveillance. In addition, updates should be published on a regular basis, such as every five years to improve the health of the nation. The committee determined there should be a balanced approach across states since some are more proactive in reporting than others. “There needs to be a priority on capturing exposure surveillance,” said Seminario, who noted it should include the risks, hazards, and exposures in the workplace. The second recommendation involves improving data collection. The committee identified gaps in safety and health surveillance that need to be addressed. For example, there is a call for enhancement and uniformity of information collected relating to race and ethnicity. In addition, the type of employee arrangement and whether employees are contract or temporary has also become increasingly important to know. Seminario added that millions of workers are self-employed, yet the BLS doesn’t have any information on those workers. The committee recommended a household survey to capture information on self-employed worker injury and illness occurrence. She said this type of survey could be used in the future to evaluate potential illnesses and exposures. Occupational information could also be pulled from general health surveys, she said. Another area that suffers from a lack of information is occupational disease. The committee suggested obtaining this information from state resources. The third recommendation involves expanding biomedical informatics use and capabilities. Essentially, the committee found that NIOSH doesn’t have the right experts in this area in-house, so the agency will need to search for outside expertise to evaluate appropriate computational methods and communication tools. In addition, this will aid in the merging of datasets from multiple sources, Seminario added. The last recommendation is to strengthen data analysis and information dissemination to encourage injury and illness prevention. According to David Buckeridge, a professor within the department of Epidemiology, Biostatistics and Occupational Health at McGill university in Montreal, this is critical for analysis and objectives to be clear. This will also help to avoid duplicative reporting and offer a way to provide the information back to employers. According to Seminario, who is the only committee member to have been on both projects, before the 1987 report, the government had no idea of the number of occupational fatalities in any given year. She said that report led to three major advances: a census of occupational fatal injury, added information on injuries including case and individual demographics, and administration data to target compliance efforts. Since that time, there’s been a big change in what’s happening at work, changing exposures, and a variety of employment arrangements. For example, the report highlights how manufacturing industry employment has declined while there has been substantial growth in the service sector. Now, a person might work multiple jobs and there’s a more diverse workforce. Workplace surveillance hasn’t kept up with the changes, she said. In addition, Seminario said NIOSH will work with states to pull together information on nonfatal or fatal disease because a lot of information exists at the state level. For example, information can be obtained from state poison control centers. The committee also suggested obtaining information from electronic health records. The goal, she said is to mine the information for industry and occupation, looking not only at a point of time but over time. Lastly, recognizing the advances in data collection since the first report, surveillance will have to leverage new technology and tools.